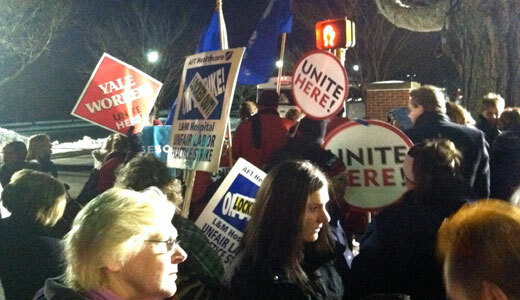 NEW LONDON, Conn. – Cheered on by a crowd of 200 co-workers and labor and community supporters, the first group of nurses and techs returned to work on Dec. 20 after being illegally locked out by Lawrence & Memorial (L&M) Hospital for 19 days, as contract negotiations continue. The caregivers’ return to work temporarily halts a standoff over the future of health service delivery for the region. Lawrence & Memorial Corporation (LMC) representatives unilaterally ordered an end to the unlawful lockout after talks with the unions representing the hospital’s caregivers failed to produce a mutual agreement. “No one can dispute that ending this illegal lockout is a win for our community,” said L&M Hospital registered nurse (RN) Lisa D’Abrosca. “We’re back to the bedside caring for our patients, and that was always our ‘number one’ priority. And we’ve moved the administration to protect vital health services for now. But we’re still committed to resolve our community’s long-term crisis of care,” said D’Abrosca, who serves as president of AFT Local 5049 and represents the hospital’s approximately 540 RNs. The workers are deamnding that the corporation stop shifting patient care services away from the community hospital while the matter remains a subject of collective bargaining negotiations. Union leaders and LMC representatives exchanged numerous proposals to address the issue during efforts that began in September to achieve successor agreements for contracts that expired November 16. The National Labor Relations Board (NLRB) has also taken up the dispute and sworn testimony is scheduled to be heard next month in an ongoing trial over the matter. “We’ve never given up on preserving access to quality patient care,” said L&M Hospital sleep lab technician Stephanie Johnson. “We always said that coming together with management — especially when we’re talking about our patients — was possible and preferable. Now that we’re back to work, we hope the administration gets back on track and is willing to work with us,” said Johnson, president of AFT Local 5051, representing approximately 250 licensed practical nurses (LPNs), healthcare technicians and technologists at the hospital. Efforts to resolve the issue in contract negotiations last month stalled and led to a vote by the members of both unions authorizing a strike to protest the unfair practice. The nurses and techs remain committed to assuring community access to quality care by skilled professionals. “Hospital leadership has shown that they were actually listening to the community,” said Melodie Peters, an LPN who worked at L&M Hospital for 15 years and serves as president of AFT Connecticut. “Pulling the plug on an illegal lockout demonstrates that the message the people of this region were delivering was received, loud and clear,” said Peters, also a former state senator. Widespread encouragement and solidarity from patients, their families, civic leaders, and elected officials has bouyed the nurses and techs before and during the illegal lockout. 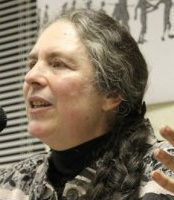 Over $65,000.00 in donations have been made to a “hardship fund” that AFT Connecticut and its national union last week set up to provide relief for the caregivers. Nearly 1,000 gifts were donated for a holiday gift delivery the federation and the United Labor Agency on Tuesday coordinated for caregivers’ children. A new ad in the “I Am L+M” public awareness effort was today placed in The Day thanking the community for their ongoing support throughout this crisis. Among those who came to show solidarity as the workers returned to their jobs were 50 Yale University workers, members of Locals 34 and 35 Unite-Here. Photo: Yale Univeristy workers were among nearly 200 who rallied in support as L & M caregivers went back on the job, ending their lockout on December 20. Matt O’Connor.